A lot of thanks to Andy as well for help with HAL issues I had. 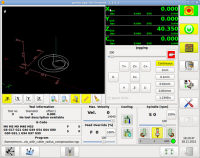 The machines I build are all going out with LinuxCNC and my custom GUI unless the customer demands WinXP with Mach3. Can you share the files to produce this? I am interested in creating a screen for lathes. Very nice and I'm glad my tutorials could help. Mind posting a link to this tutorial? Last edit: 29 Nov 2013 06:28 by DaOne. I like your design, did you make all the widgets yourself, or is that just a custom theme? Where can I see the machines you make? How did you force the glade widgets to be the correct shape and size? @ JT - I wrote a scale function so the widgets scales to any screen size. I used transparent event boxes instead of buttons. I had to tweak some of the GladeVCP code so the widgets such as the LED's will have scaled sizes. @ Norbert and emcPT - I will tweak and clean up my code a bit, as it was done specifically for my machines. I also had to change some of the GladeVCP objects to suite my needs and they no longer work correctly in Axis, such as gremlin. Once done I will post the project.